OCC News - What to do with all the plastic? What to do with all the plastic? Two OCC rallys cooperating with OCC Member Steve Brown's Coastal Clean-up have raised the question about how to best dispose of the collected plastic. Sadly the San Blas, the Western Caribbean, and Australia all share the issue, which is the tip of a huge iceberg, and the same problem is experienced all around the world. 3. Of the 8.3 billion metric tons that has been produced, 6.3 billion metric tons has become plastic waste. 4. There are more than 50 different types of plastics, making them more difficult to sort and reprocess than other recyclable materials. 7. Countries like China, Indonesia, the Philippines, Thailand, and Vietnam contribute to 60% of ocean plastic due to mismanaged landfills. 8. Research shows 90% of the plastic waste in the world’s oceans is carried there by just 10 rivers - two of which are in India. In the long term, the problem has to be solved at its source. Rather than looking for the next place to dump plastic waste, we need to bear the responsibility of cutting waste generation through sustainable practices. In the short term WE need to do something about it! 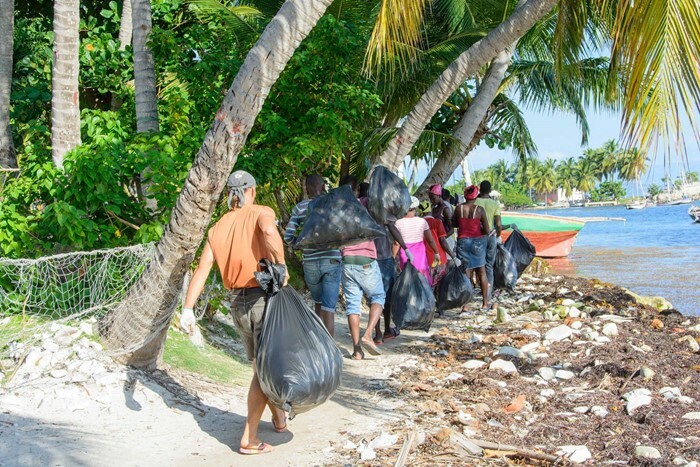 We cleaned up 71 bags in just one hour off the beach in Port Morgan, Isle a Vache, Haiti. There are lots of ongoing but disjointed initiatives out there but they are focused on recycling what is used on land and the other coastal clean-up initiatives face the same problem....What to do with it all? The 1 Hour Clean-up Power group I met in Bonaire have now collected 3,000 large bags off a short stretch of coastline in just 11 months.... and it has all gone onto a dump where it is being blown around in the winter trade winds! Sorting and processing is labour intensive and expensive. Many local authorities sort only the clear plastic PET from household waste and incinerate everything else while claiming that they have an effective recycling policy. We have to face the added problem that this is dirty, co-mingled plastic waste consisting of many different types of plastic, paper, aluminium foil, liquids, sand and other marine residues. Many of the islands are some of the poorest in the world and their inhabitants have far more pressing problems than the state of their beaches. I am researching the many organisations and initiatives out there (almost as many as the different types of plastic and packaging) to see if we can work alongside them. Check out https://www.plasticbank.com/ whose approach has great merit in the areas we cruising sailors visit but does not work with the type of plastic we collect nor the communities without any infrastructure. I am sorry that I cannot be more helpful at this stage but, as you see above, the realities are overwhelming. That does not mean we should stop picking plastic up off our coastlines nor that we won't continue to search for a solution.